Saffron Tree: How does it feel to be old? When I was a little kid, persons over 20 or so seemed sooooo old to me. I couldn't even begin to think about how it would be to be really old. My grandmother lived with us for all my growing-up years, but although she told me many stories of her childhood and youth, I do not remember her speaking to me much about her old age. Maybe because it was beyond my comprehension at the time, and so I did not ask. I wish I had. Like this little girl in our book. The little girl in our story asks the question of her grandmother- her mother's mother. Hmmm...first the grandmother answers from a child's point-of-view. ...I please myself, make my own choice." There are things one can do just because you're so much older than everyone else around. by being a demon, taking a chance. But then the granmother becomes contemplative. "Have you noticed how crayons wobble now? And now there's a waiting. Until then, there's a lot of living to do. with her family at her side. 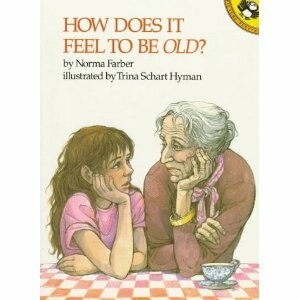 The little girl asking the question was Emilie, grand-daughter to the illustrator, Trina Schart Hyman, whose evocative pencil and ink sketches in black-and-white-and-sepia bring alive the text by Norma Farber, sometimes making you sad, but also making you smile. A lovely book. A was mesmerised by the title, and read it at one go. "It's a lovely book, Aai," she told me. Yes, it is. Brought my grandmother alive in my memories again. Singing songs to me, telling me bedtime stories, reading the Dnyaneshwari with me in her lap, making goodies to eat when I came home from school, lighting the lamp in the evening and making us say our prayers...so this is how she felt, being old!